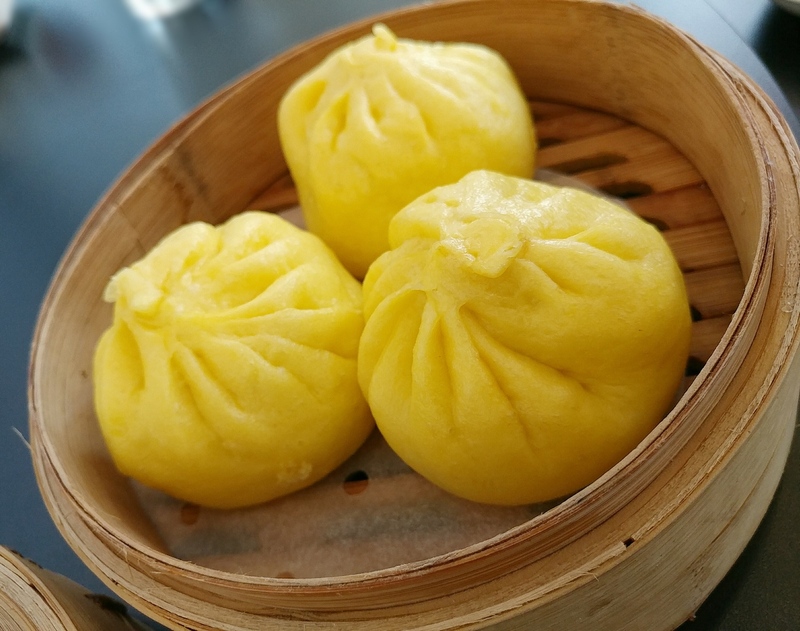 Kimchi Cheese Smile opened in Woolloongabba a couple of months ago, and though there wasn’t much fanfare, the name and the premise were interesting. Modern Korean food with a twist. 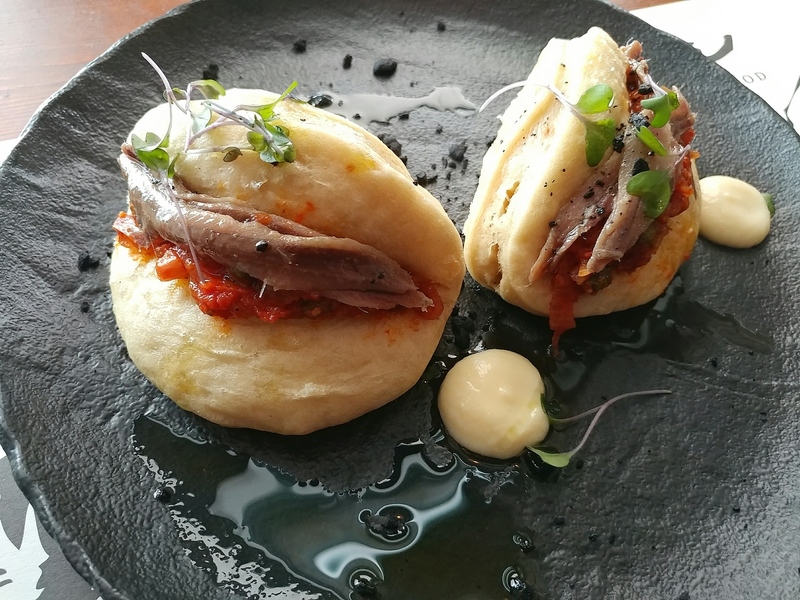 Korean cuisine has certainly gained a visible presence in Melbourne in the last few years, but is yet to become quite as widespread in Brisbane. 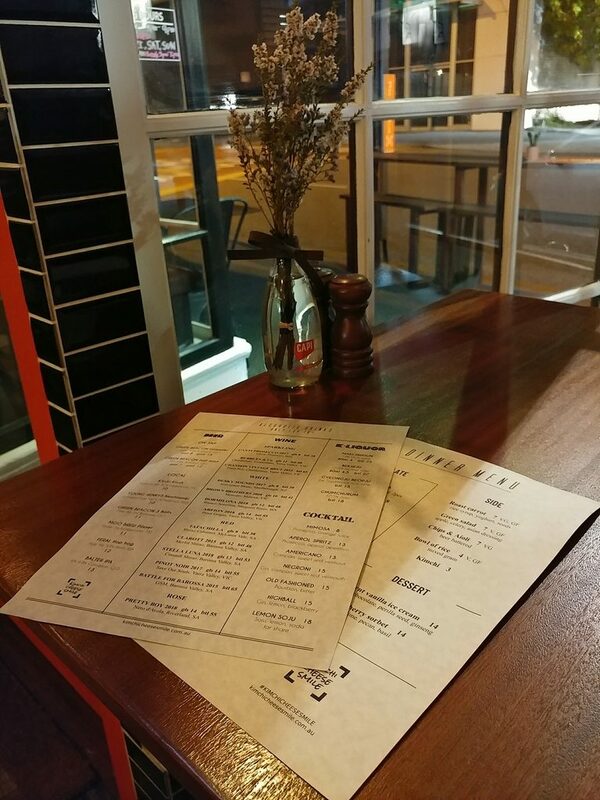 We were curious to find out what Kimchi Cheese Smile had to bring to the Brisbane dining scene, so made a visit one evening. 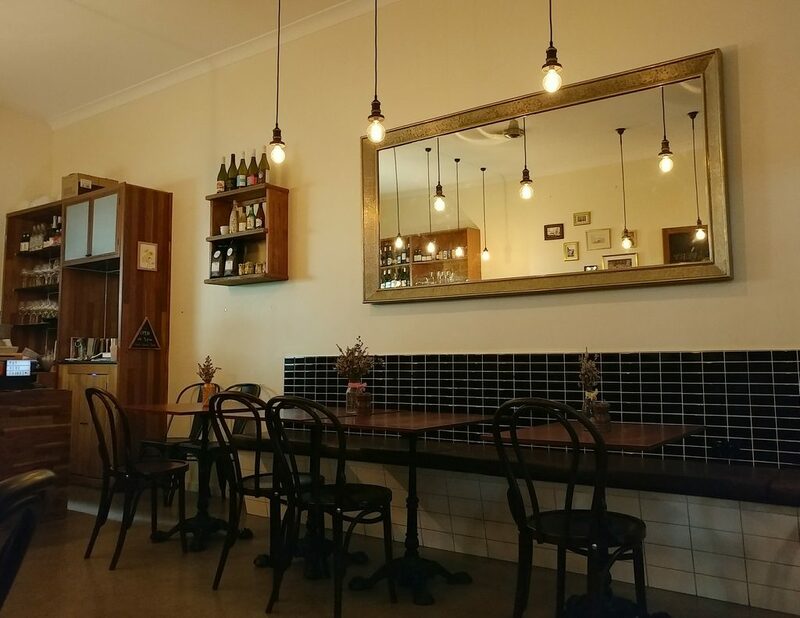 It is located along Stanley Street East, a stone’s throw from the Gabba, and just down the road from the PawPaw Cafe, having taken over the lot once tenanted by the Catbird Seat Bistro. It is probably easier to find in the daytime than at night, as the signs on the posts in front of the entrance don’t quite stand out if you approach from the pedestrian walkway. The outside of Kimchi Cheese Smile. As we stepped through the door, we found ourselves in a space with a cosy hideaway bar feel. Pendant lights hung down from above, with their twisting orange filaments providing low, warm lighting. The cream-coloured walls were contrasted by dark wooden panelling on the lower halves in some sections, and black subway tiles in other sections. A view of the inside of Kimchi Cheese Smile. The wood-topped tables and dark bentwood chairs were placed a comfortable distance apart, so that it did not feel like one would be too cramped in with other patrons. There were padded bench seats along one wall, thoughtfully with wall sockets at intervals to allow patrons to charge their phones or laptops (a boon in the modern device-dependant age). More of the interior, power points for charging along the back of the bench seats. The space was air-conditioned, and fans also kept the cool air moving. 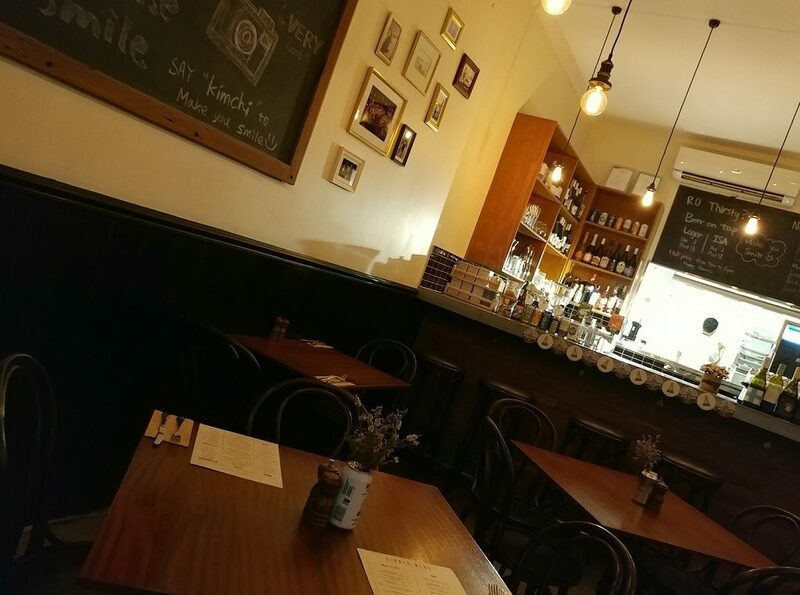 Laid back indie pop music ballads played over the speakers at a comfortable volume, giving the eatery a relaxed feel. 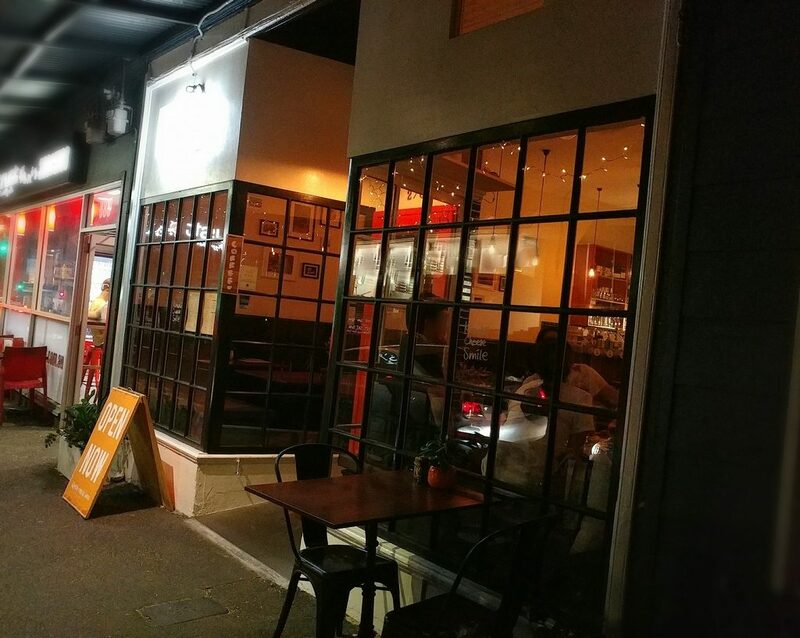 Although large bay windows at the front of the restaurant faced a busy road (Stanley Street East), the door being closed kept traffic noise out. We were greeted as we walked through the door, and shown to an available table. Menus were brought out, sheets of paper with food options printed on one side and drinks on the other. The food was a mix of Korean and Italian fusion dishes. There were small plates (entrees), main plates, and sides. 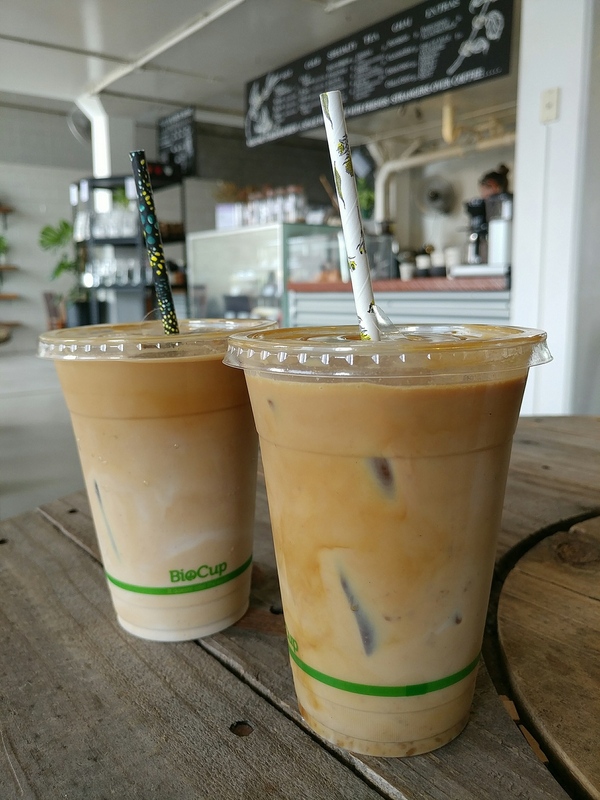 They had non-alcoholic drinks (coffees, milkshakes, and sodas), and alcoholic drinks that similarly spanned cultures, with a range of beers, wines, and Korean liquors. The menus and table setup. After a good deal of pondering, we decided to have the Korean Fried Chicken from the small plates section, and the Strozzapreti and the Spicy Pork from the main plates section. We were advised to order a bowl of rice to accompany the pork, and couldn’t not get a side of kimchi as well. 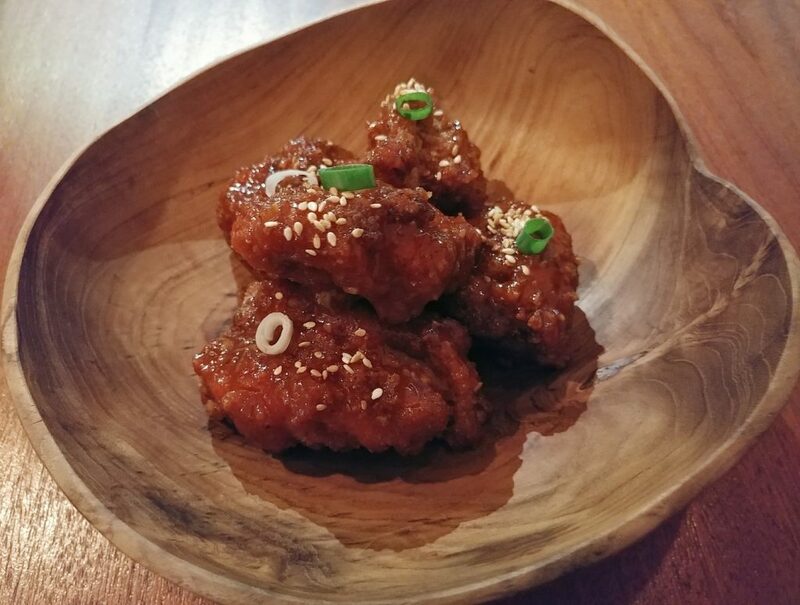 The Korean Fried Chicken was brought out in a carved wooden dish, the boneless chicken pieces in a neat stack, garnished with sesame seeds, a sliced spring onion ring placed on each piece. Sweet, fruity aromas wafted up from the dish as it came to the table. The chicken was piping hot, and the meat tender. The coating on the chicken was a fine crumb, almost powdery, and delicately crunchy. It was a different texture from that of the Korean Fried Chicken we had had at other eateries (like Seoul Bistro and Momo Chicken). It was coated in a sauce that had a warming heat without being overpowering, sweet and sour notes, and a hint of plum. We were told that the sauce was made with fermented chillies. It covered the chicken pieces without smothering it, or taking away the crunch. 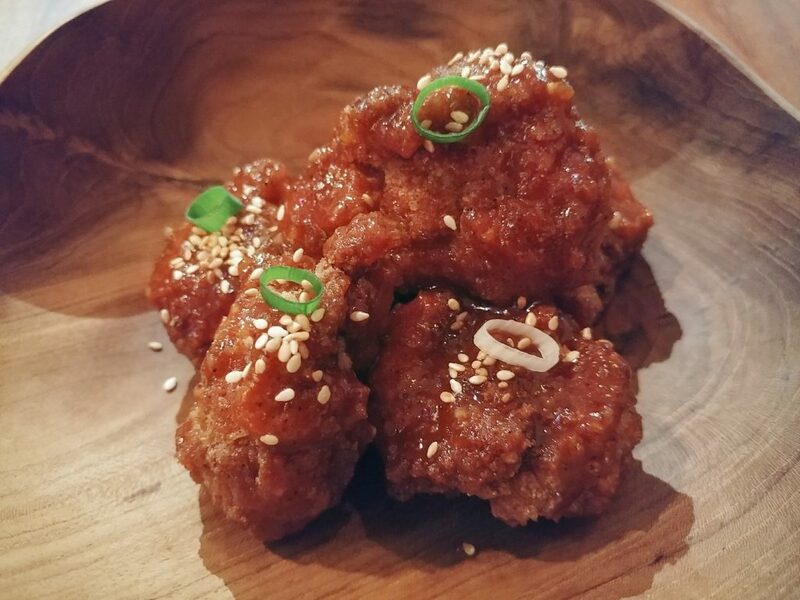 The Korean Fried Chicken, closer up. 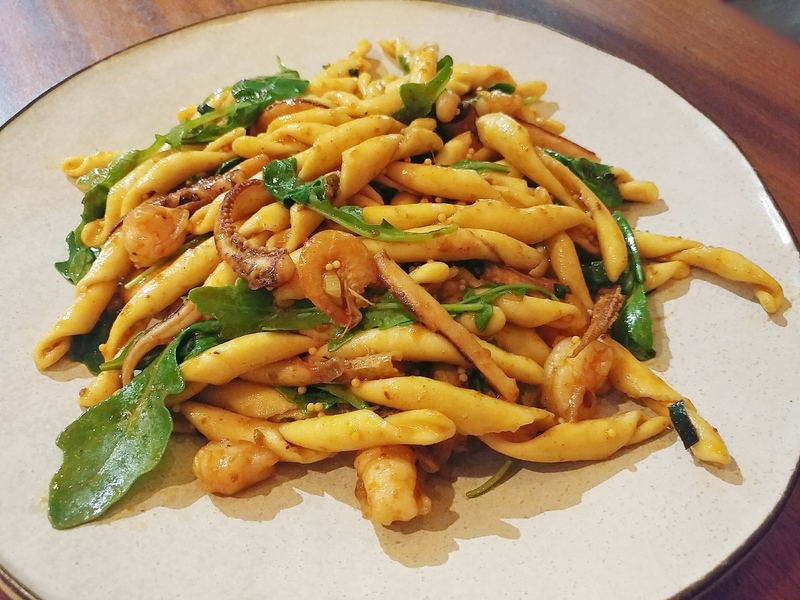 The Strozzapreti had caught our eye very quickly as we looked through the menu, both for the very Italian name and the ingredients it came with – prawn, squid, tobiko, rocket, and XO sauce. 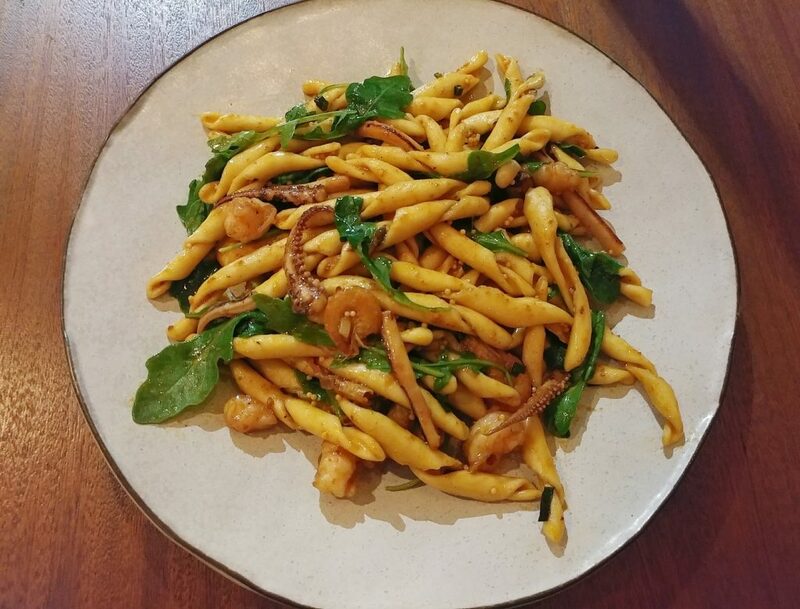 The curly pasta was served spread across the plate, the squid tentacles winding through the mass of pasta in a similar shape. Strozzapreti is not a very common type of pasta to encounter, but does have an interesting backstory, translating to “priest strangler”. It had an al dente chew, and the sauce, which was a drier, aglio e olio style rather than a wetter marinara style, coated it well. 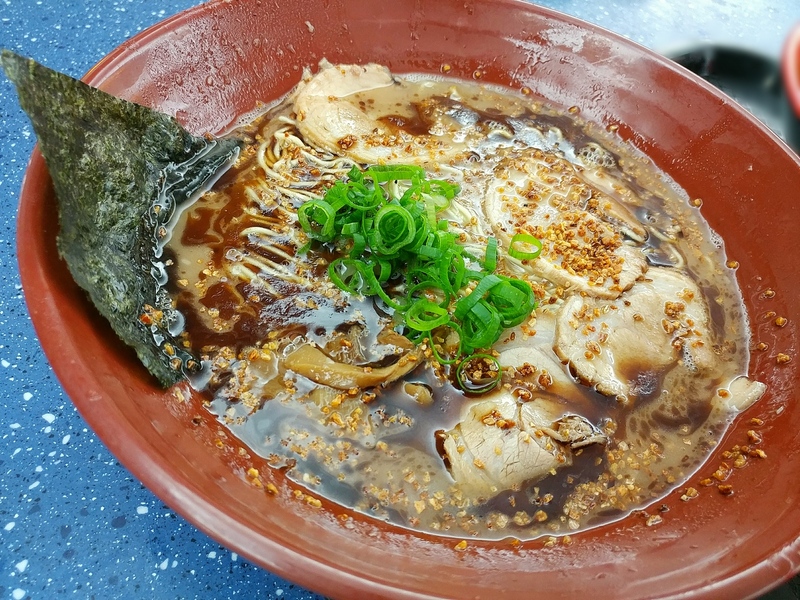 The sauce had an almost perfumed flavour, which we recognised as shiso. It was certainly different from typical Italian flavours. The prawns in the dish came in two sizes – pieces of regular-sized prawns that had been cut up, and whole smaller sized prawns (school prawns). The pieces of whole prawn were nicely cooked, so they still had spring. The school prawns were cooked and served shells, legs and all, though headless. They had a crisp crunch as you bit through the shells, and, while probably done as they were meant to be done, were texturally different from what we were expecting. They reminded us of the fried crickets we had had in Cambodia, with the fiddly legs.. The tobiko was mixed through the pasta as well, and though there wasn’t enough of it en masse to give a distinct bubbly pop, it probably subtly added to the seafood flavour. The Strozzapreti, with prawn, squid, tobiko, and XO sauce. The pasta dish closer up, with different sized prawns. The Spicy Pork dish was listed as also having mushrooms and bean sprouts, and perilla seed oil. 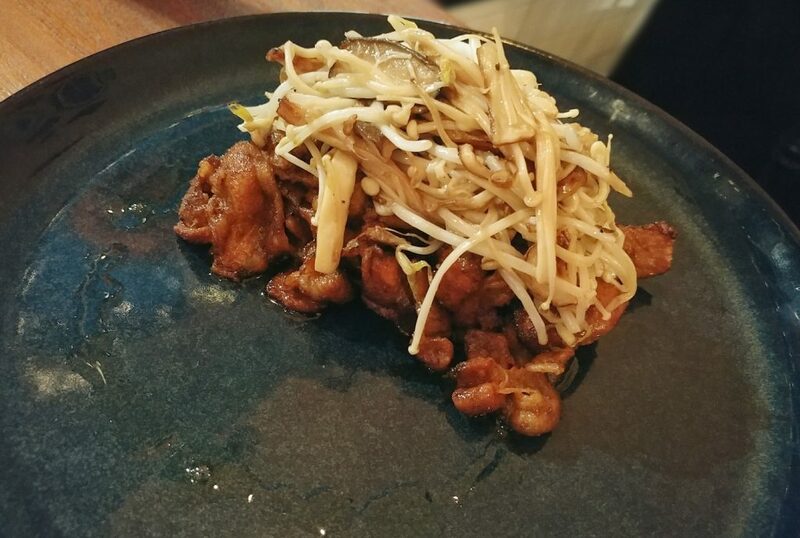 The slices of char grilled pork were served in a heap on one side of the plate, blanketed with a mix of bean sprouts, enoki mushrooms, and other sliced mushrooms. The pork slices were tender, and had smoky charcoal flavours, complimented by a sweet and salty glaze. The meat was caramelised from the heat as well, so had its own rich sweetness. The mushrooms and beansprouts were tender. This was a tasty dish, and definitely more strongly flavoured than the pasta. It was good advice to have rice with it though, as that made it a more filling, complete dish. 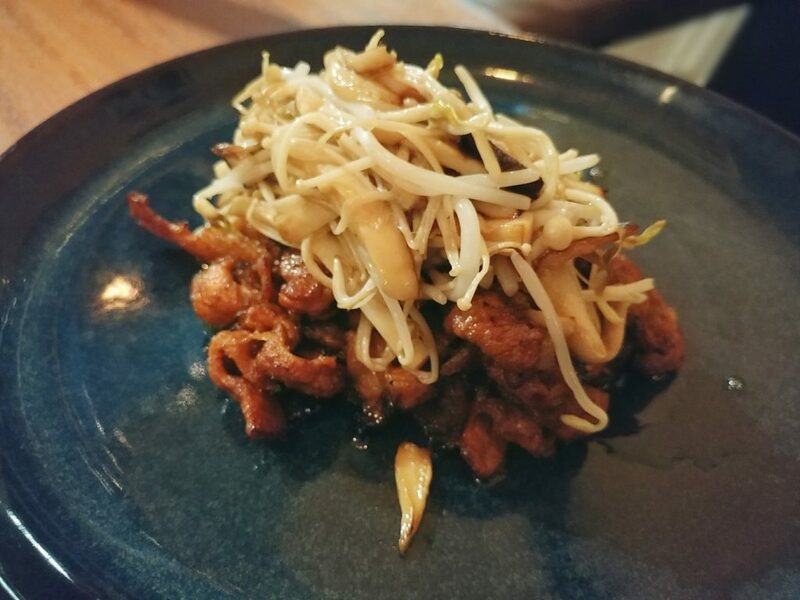 The Spicy pork, with mushrooms and beansprouts, and perilla seed oil. 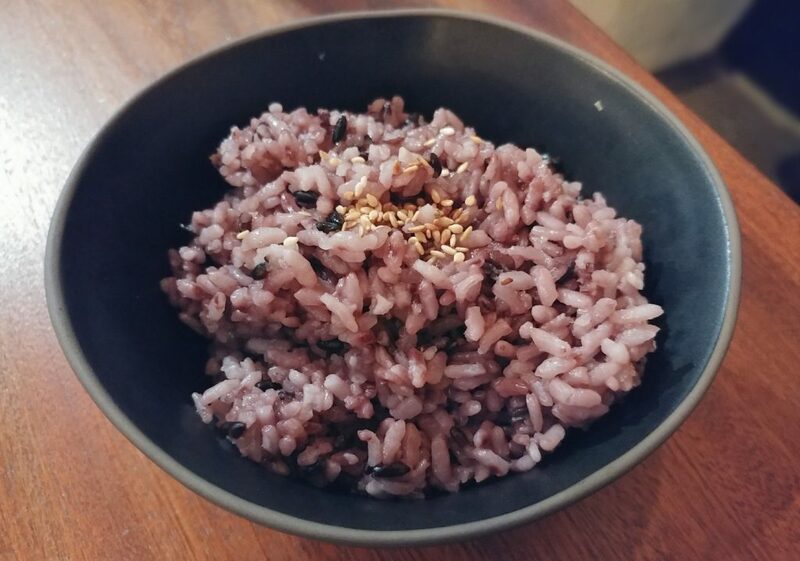 The rice was a purple rice, with other grains mixed in. We are usually leery of ordering rice at restaurants, as it often seems not worth the price per bowl (which is how you usually have to order it), given the cost of buying rice yourself and how simple it is to prepare. Still, this was at least something different. The rice was sticky, like a glutinous rice, but light, and not gluggy. 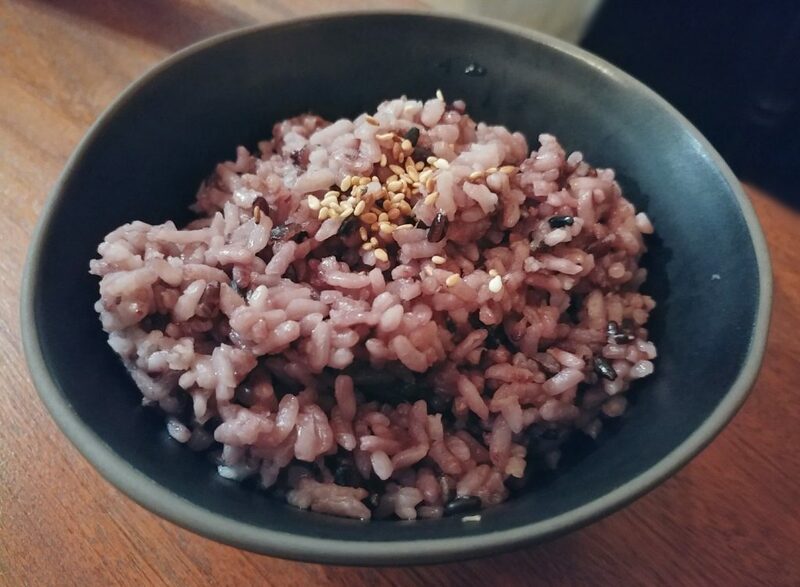 The bowl of mixed grain rice. The mixed rice bowl again, because it looks cool. 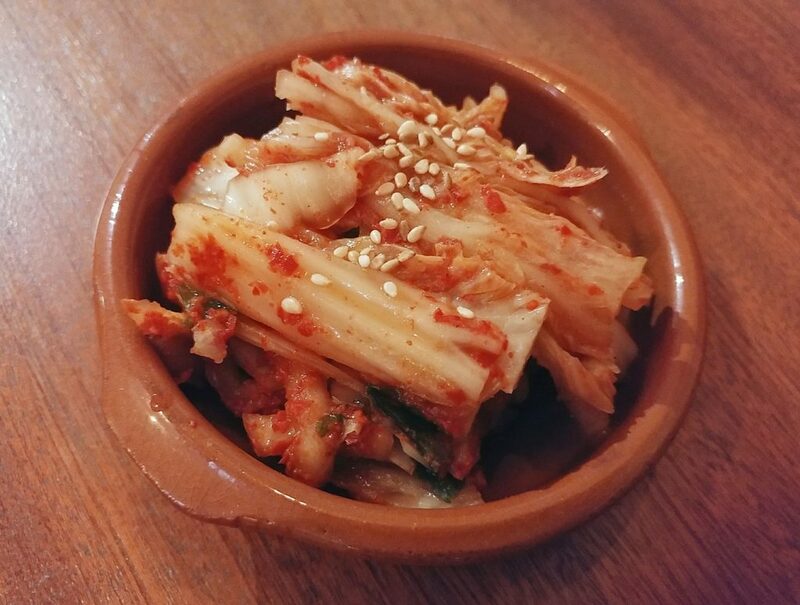 No Korean restaurant could call itself a real Korean restaurant without kimchi. 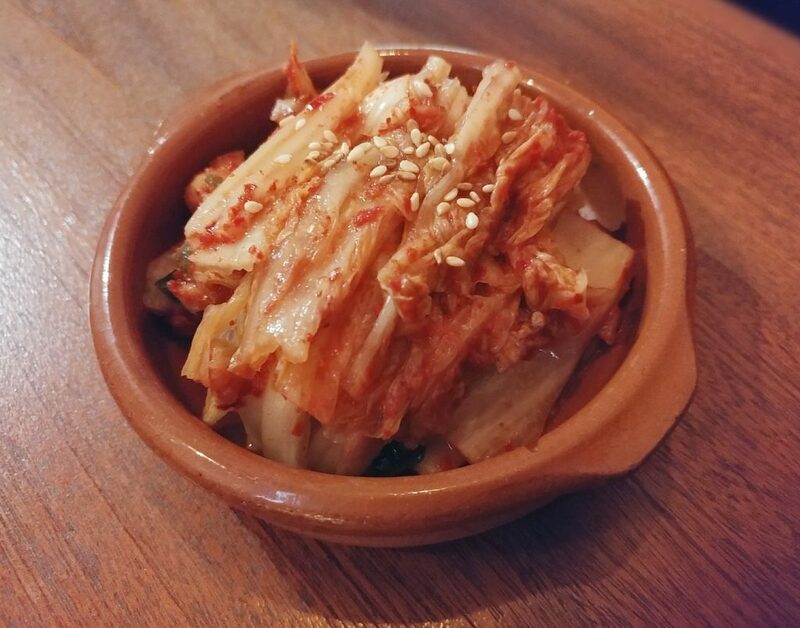 The kimchi was served in a little dish, cabbage leaves neatly sliced and layered. 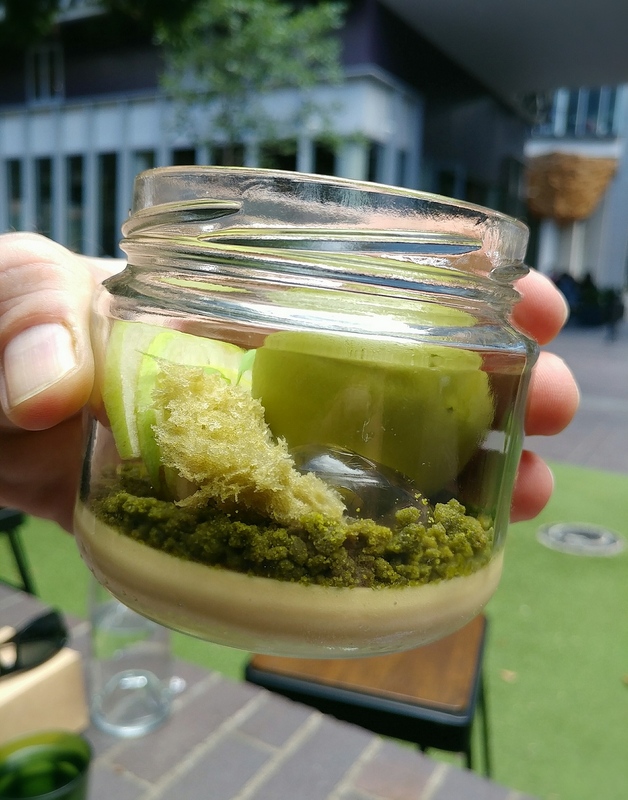 It was pungent and spicy, but not sour or acidic. It added a kick when had with bites of the other dishes. We had a chance to chat in between the food, and learned that Kimchi Cheese Smile is run by a husband and wife team. 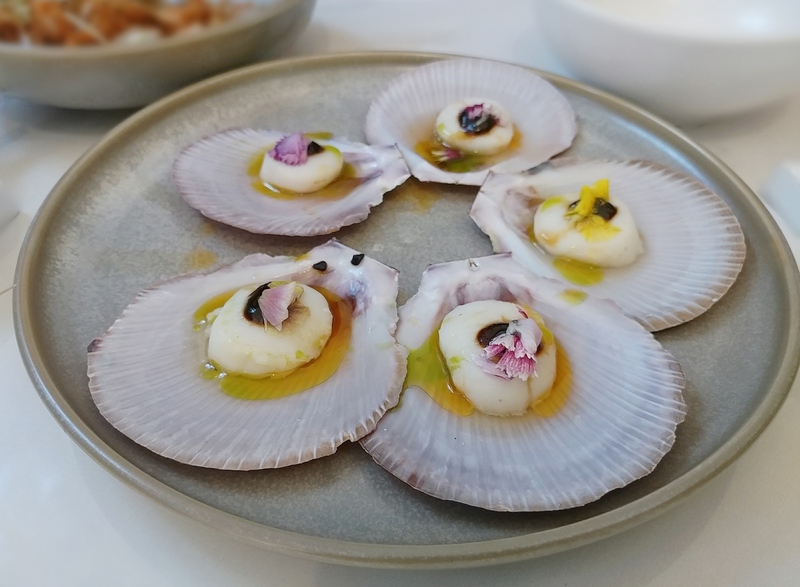 The Korean couple had dreamed of opening their own restaurant for some time, and the vision is to present modern dishes that are a bit finer and more sophisticated than you would find at a typical casual Korean eatery. They named it Kimchi Cheese Smile because “Kimchi” is what people way in Korea to get people to smile before they take a photo, in the same way that people in Western countries say “Cheese” before their photos. They want to make people happy with their food, and make them smile, hence the name. We had a pleasant dining experience at Kimchi Cheese Smile. It remains to be seen whether Brisbane is ready for finer Korean food, or whether it wants to stick to the more casual Korean BBQ and Korean fried chicken for now. They do also have lunch specials, if you are after something more low key to test the waters though. Price point: Small plates $6 to $15. Mains $26 to $35. Value: Alright. The food was quite tasty, but you do need to know that it is restaurant rather than casual eatery pricing.